The Swim Rotorua team have successfully defended their Central North Island title. In a hard-fought battle with AquaBladz (New Plymouth) and EVO (Tauranga), the Rotorua swimmers ground out a home victory. Leading the way for the 37-strong team was David Boles who managed a monster programme of 12 events. He shone in all of his events to amass a stellar 178 points for the team. His standout performance came in the 1500m freestyle which he paced to perfection to seal victory with a new best time of 16m 10.07s. He doubled his gold medal tally in the 200m backstroke, with a time of 2m 6.74s. Theo Harvey achieved six wins in the boys' 12-13 years age group. They came in the 50m freestyle, 50m butterfly, 400m freestyle, 200m freestyle and 100m backstroke, plus a debut splash under the magical one minute barrier in the 100m freestyle. Ngamihi Simpson dominated her age group, also picking up six wins. They were the 200m and 400m medley, 50m and 100m freestyle, 200m backstroke and a great effort in the 100m butterfly with a time of 1m 14.88s. Miki Joyce produced a clean sweep in the boys' 11 years breaststroke events. Miki produced times of 38.56s, 1m 25.52s and 3m 5.67s for the 50m, 100m and 200m events. Another brace of wins came in the 100m and 400m medley races. Sprint star James Baldwin was a worthy winner in the 16 years and over 50m freestyle with a time of 24.77s. Sam Trass won the boys' 13 years and under 200m butterfly. His time of 2m 44.95s meant he achieved 100 per cent best times in his races. Annelyse Cowie claimed victory in the girls' 14-15 years 100m and 200m breaststroke. She produced best times and further medals in the 100m butterfly and 400m medley. Older sibling Damon Cowie was back in the pool after a long injury lay-off and showed remarkable composure to win the boys' 16 years and older 200m butterfly. Skye Cox improved her backstroke to win the 200m event, and come second in the 100m event. Ana and Joe Nagera made a welcome return to the pool to scoop up some medals. Both recently nominated as Rotorua Young Achievers, they excelled in the sprint events. Joe won the 50m backstroke with a time of 27.51s, which was a new Bay of Plenty record. Ana took top honours in her signature 100m breaststroke event with a time of 1m 26.10s. Kaia Joyce won 10 medals in the 10-11 years age group. This included three new Bay of Plenty records in the 50m freestyle, 50m backstroke and 200m medley. Other notable individual performances came from Josh Balmer, just back from his New Zealand team debut in Canberra, in the 100m backstroke, Jasmine Hagan in the 100m freestyle with a time of 1m 2.60s, Rocco Marsh for breaking the two-minute barrier in the 200m freestyle, Alex Cameron for third place in the 100m medley, Molly Sinclair for second place in the 100m butterfly and Emily Spear for second place and first time under three minutes in the 200m breaststroke. In the relays, there was an intense rivalry between the clubs. Swim Rotorua picked up four second places to boost their points tally. 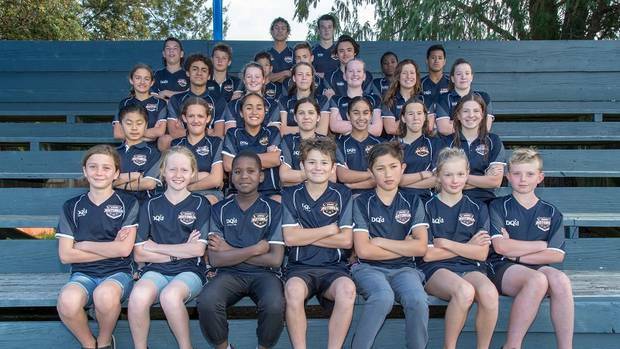 They also had wins in the boys' 13 years and under 4x50m medley (Taonga Wharekura, Miki Joyce, Theo Harvey and Dion Wright), boys' 13 years 4x50m freestyle (Dion Wright, Taonga Wharekura, Aaron Muchirahondo and Theo Harvey), girls' 13 years and under 4x50m freestyle (Alex Cameron, Lina Stahlhut, Ngamihi Simpson and Jasmine Hagan) and in the men's open 4x50m freestyle (James Baldwin, Josh Balmer, Rocco Marsh and David Boles). Head coach Alastair Johnson said it was "a fantastic team performance from the youngest to the oldest". "We all knew that we would have to battle hard and stay competitive to the very last race to give ourselves a chance of retaining the CNI trophy. Everyone has given their all and I am delighted and super proud of them," he said.